In many ways, it was just another awesome day at the U.S. Open. Leander Paes and his partner won the mens’ doubles final; Serena Williams, won the womens’ championship; a boy from Croatia became the junior singles champion, while a 15-year-old with the first name “Tornado,” would narrowly miss an upset win of the junior girls’ championship. And on courts 7 and 11, equally talented athletes with lesser-known names were also gearing up for two more finals, both in wheelchair tennis. In many ways, wheelchair tennis is just a regular part of the US Open. At the same time, it’s quite extraordinary. 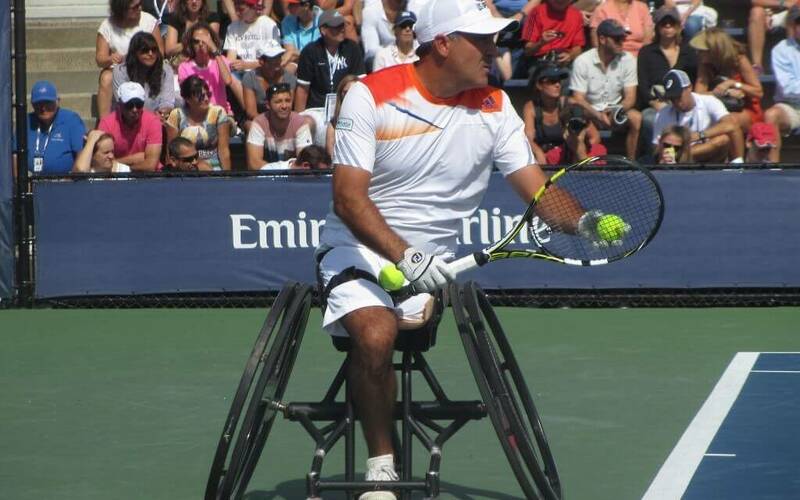 Each wheelchair tennis player has his or her unique story. As a credentialed journalist (I also covered the Open for the Times of Israel), I am lucky enough to learn more about these athletes when I receive a copy of the 2013 U.S. Open Tennis Championship Wheelchair Tennis Competition Media Guide, as well as a supplemental packet of player biographies. On court 7, I saw the #2 seed, Stephane Houdet of France, and the #1 seed, Shingo Kuneida of Japan, preparing for their match, which Houdet won. Houdet, who has two sets of twins and a veterinary degree, started to play tennis at the age of 8, then again at the age of 34 – ten years after his motorbike accident. Kuneida played tennis recreationally from ages 11 to 16 and then learned to play wheelchair tennis after becoming paralyzed by spine tumor surgery. In wheelchair tennis, “preparing,” means transferring from regular wheelchairs to specially designed game chairs (large angled wheels, two small wheels in front, one small wheel in back), checking air in their tires, strapping themselves in to their chairs and putting in mouth guards. While wheelchair tennis has chair umpires, line judges and ball persons, each player has his or her own method of storing balls—in their laps, in a bag behind the chair, or in their spokes. Court 11 hosted the Quad Singles Final is about to begin, with Lucas Sithole of Johannesburg battling #1 seed David Wagner of the United States. Wagner had been a college tennis player before a water accident 18 years ago. The left-hander is an incredible athlete, using his partial right arm to help guide his chair as he races to each ball. Sithole stuns Wagner, upsetting him: 3-6, 6-4, 6-4. Tennis fans like me returned home that Sunday having experienced quite an impressive scene — one of true inclusion. Tennis has found a way to naturally include athletes who have both disabilities and extraordinary abilities. I wonder if tennis fans know that wheelchair tennis boasts a unique statistic: Esther Vergeerretired from wheelchair tennis last February with an active singles win streak of 470 matches. The last match she lost was ten years before her retirement, in January, 2003. Now, that’s an athlete we can all strive to emulate.